The son of a minister, Gaye was raised on church music and first made his mark singing backing vocals on records by Chuck Berry and Etta James. He also worked as a session drummer, playing on the Number 1 hits Please Mr Postman (Marvelettes) and Fingertips Pt 2 (Stevie Wonder), signing to Motown as a solo act in 1961. Initially covering standards, he had hit first hit with the self-written Stubborn Kind Of Fellow in 1962, going on to form successful duo acts with Tammi Terrell and Kim Weston. The death of Tammi Terrell from a brain tumour in 1970 forced him to re-evaluate his career and he broke the Motown mould with his passionate, political concept album What's Going On. The first black act to take control of his own musical direction, he took soul music to a new level with classics like Sexual Healing. However, his behaviour was increasingly erratic and in 1984 he was shot dead by his own father. This Compilation ℗ 2015 Motown Records, a Division of UMG Recordings, Inc.
℗ 1970 Motown Records, a Division of UMG Recordings, Inc.
℗ 1969 Motown Records, a Division of UMG Recordings, Inc.
℗ 1995 Motown Records, a Division of UMG Recordings, Inc. 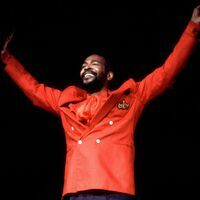 Writer: Berry Gordy Jr. / Composers: Berry Gordy Jr. This Compilation ℗ 2011 Motown Records, a Division of UMG Recordings, Inc.
℗ 2007 Motown Record Company L.P.